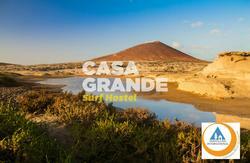 Casa Grande Surf Hostel is the ideal place to get to know the island of Tenerife. We are located on the seashore of El Medano, a coastal village only 5 minutes from Tenerife South airport, with sunny weather all year round and a pleasant and relaxing atmosphere, with beautiful walks along the coast and open-air seafront bars to enjoy a drink. In addition to accommodation, we offer our guests surf and sea sport services, equipment rental, board storage, windsurf and kite surf lessons and shop. 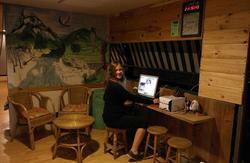 There are also other activities such as outings, hikes, language lessons, barbeque's, etc. BUS: Take bus 111 (every 30 minutes) and leave after one stop (motorway cross San Isidro). Here you can take either bus 470 or 116 in direction El Mdano. Each bus will take approximately 5 minutes. TAXI: Best option Costs approximately 12-15 from the airport to El Mdano. Both the bus and the taxi stop (at Plaza de El Mdano) are within walking distance to the hostel.